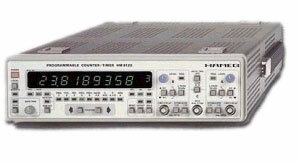 Frequency Range 0 - 1.6GHz; 3 Inputs 9 Measuring Functions; Ext. Gate and Arming Up to 9-digit Resolution at 1s Gate Time 100MHz Time Base with ±0.5ppm Stability Optional IEEE-488 Bus or RS-232 Interface Resolution as fine as 1ps is obtained through time interval averaging. The HM8122 displays low frequency measurements with an 8-digit resolution at a 1s gate time. Besides its nine basic functions, the HM8122 offers such practical features as a pre selectable number of pulses per rotation, offset, display hold, single shot measurement, external ports for gating, arming, gate view and trigger view.